Fold the cardstock paper as a triangle as shown below. We just went with raw measurements. If you are making many cards and specific about measurements, you can use a template. Draw a slanting line as shown. Cut coordinating bottom band rectangles based on the triangle card above. Adhere them with glue. Cut a small circle and make it to look like a pom pom. Adhere the pom pom on the top of the cone. Embellish with glitter glue,buttons. For inside of the card, Cut a smaller triangle from white paper and adhere it to the inside of the card. Do check out the party hat birthday cards on small fry & co! 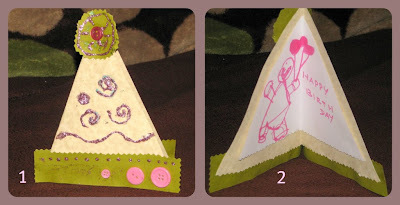 The cards look so adorable and She has a very neat tutorial with template! That is a really cute card!! Love it:) Thanks for sharing. What a very cute design. Would make great birthday party invites too! I love it! I was thinking about making it a red and green for the holidays too!